Leverage data to drive smart, effective action. Building and portfolio optimization comes in many forms. From monthly utility analytics to real-time energy management, owners and operators can learn how their building performs so they can make improvements to reduce consumption and lower costs. Compare your buildings to its peers, make data-driven decisions, and monitor project performance with Bright Power’s comprehensive proprietary data analytics services. EnergyScoreCards is a comprehensive cloud-based energy and water analysis platform and benchmarking service—the only one on the market that comes with a dedicated energy analyst who actively monitors consumption and cost at the building and portfolio levels. Knowing performance before you make energy and water investment decisions will lead to greater savings and investment impact. The platform will help you avoid upgrades that aren’t right for your building and direct your efforts towards properties and projects that will yield the highest returns. EnergyScoreCards takes care of all your reporting needs and ensures improvements are performing as intended through alerts as well as measurement and verification tools. If you are building a new development in New York City and are seeking Enterprise Green Community (EGC) or another green building certification, you’ll need to engage with a benchmarking partner. Bright Power’s EnergyScoreCards is one of the approved providers and will meet all EGC, HPD, HDC, and HFA requirements. How do you manage all of your buildings’ data? How can maintenance and operating teams track the value of improvements, and predict potential failures or other issues that will impact the bottom line? And how do you bridge the chasm between the design, operations, and maintenance teams for your new development? Bright Power believes the successful operation of sustainable buildings—both new and existing—depends on using state-of-the-art data analysis, running intelligent building systems and controls, and having expert technical support to quickly turn data into action. Without this, building owners run the risk of wasting time and money on equipment and systems that don’t run properly. MoBIUS® (Management of Building Information, Utilities, & Systems) utilizes real-time energy monitoring and continuous commissioning to diagnose and reduce energy consumption. It does so while Bright Power experts provide on-site and remote technical support to help you fix, prioritize, and maintain systems equipment. And we will train your staff to enhance organizational capacity. The result is optimal systems performance, reduced operating costs, and improved occupant comfort. Continually monitor and notify building staff when equipment isn’t working optimally. Analyze data to identify aging and inefficient equipment, allowing your staff to take the guesswork out of facilities management. Develop solutions early on so that your building operates at peak performance. Know what’s happening at your building in real-time. Bright Power offers continuous energy management that diagnoses problems early on and reduces energy consumption. Our technical support team will analyze your data, provide action-ready solutions, increase the efficiency of building systems, and allow your staff to take the guesswork out of facilities management. Most importantly, we provide direct communication to both owner and site staff to get everyone on the same page. The net result is that your building’s systems perform optimally. Train your operations and maintenance staff to run your building systems effectively and maximize their ability to operate new high-performance equipment. Bright Power will create a detailed, customized system manual that can be passed from superintendents to management staff, building out a strong institutional learning library specific to your building’s operations and your staff’s needs. We work with your operations team—from the field to the office—to manage capital planning, develop operational best practices, and improve efficiency within your organization. Bright Power’s MoBIUS energy management team will become another member of your operations team, saving you from having to make additional hires. No matter the age of your building, it is critical to establish its operational and maintenance objectives—and develop a plan to achieve them. This is not easy when your staff is overloaded with day-to-day operations. The Bright Power MoBIUS energy management team will help your organization set and attain those long term objectives by working with all levels of the operations team, conducting interviews with staff, and identifying mechanical needs over time. We set up and monitor 5-year capital plans and energy management goals to keep you on track. Bright Power staff can also assist management by quantifying savings, developing tenant trainings, and establishing best practices for operations at each of your buildings. We get involved in the design phase of new developments to integrate any specifications for remote monitoring equipment. Estimates for hardware and its installation are included from the outset so you can easily add them into your budget. When it comes time to transition from construction to occupancy, Bright Power will be there to guide the process. 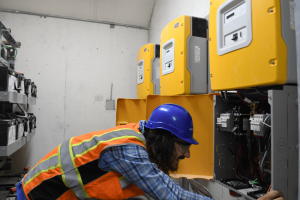 From development of equipment manuals to training the operations and maintenance staff, to providing energy management services that monitor and optimize equipment operation in real time, Bright Power will help reduce costs and stress. Selfhelp Community Services has worked with Bright Power's MoBIUS team since 2015. Each year, month, and day, they help us save on energy costs, provide more comfortable homes for our residents, reduce service calls, optimize our operational efficiency, and increase the productivity of our maintenance staff. We greatly value Bright Power's expertise.